Garage: "Garage: 2 Car Detached; Parking Space(s): 2"
The Lodges - townhouse living at its finest! 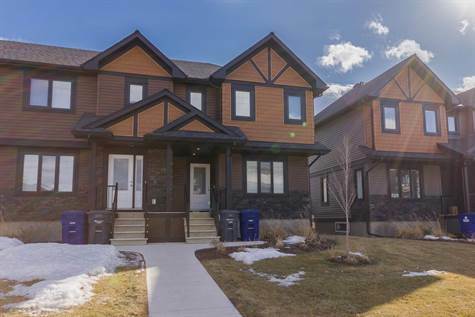 Located in prime area of Evergreen, this exceptional, 1378 sq.ft. two storey CORNER unit is immaculate and loaded with features. High end laminate flooring ties together the modern open concept living room, dining and kitchen. Espresso cabinetry with granite counters, island with breakfast bar, pantry and stainless steel appliances highlight the kitchen that opens to a spacious dining area. Main floor laundry and a two piece bath are conveniently located on the main floor. On the second level are three bedrooms and a four piece main bath – the large master offers a four piece ensuite and walk in closet. All three bathrooms feature sleek tile flooring and granite vanity tops. The full basement is open for future development. A backyard deck accesses the fully fenced and landscaped yard, with a double detached garage. Evergreen incorporates the urban village concept - The Lodges are close to the village square with convenient access to shopping, amenities and new north commuter bridge.